A person’s body is affected by the arrangement of the work area and by the tasks that he or she does while standing. The layout of the workstation, the tools, and the placement of keys, controls and displays that the worker needs to operate or observe will determine, and as rule, limit the body positions that the worker can assume while standing. As a result, the worker has fewer body positions to choose from, and the positions themselves are more rigid. This gives the worker less freedom to move around and to rest working muscles. This lack of flexibility in choosing body positions contributes to health problems. These conditions commonly occur where the job is designed without considering the characteristics of the human body. When job design ignores the basic needs of the human body (and individual workers), work can cause discomfort in the short term and can eventually lead to severe and chronic health problems. Keeping the body in an upright position requires considerable muscular effort that is particularly unhealthy even while standing motionless. It effectively reduces the blood supply to the loaded muscles. Insufficient blood flow accelerates the onset of fatigue and causes pain in the muscles of the legs, back and neck (these are the muscles used to maintain an upright position). In a well-designed workplace, the worker has the opportunity to choose from among a variety of well-balanced working positions and to change between them frequently. Working tables and benches should be adjustable. Being able to adjust the working height is particularly important to match the workstation to the worker’s individual body size and to the worker’s particular task. Adjustability ensures that the worker has an opportunity to carry out work in well-balanced body positions. If the workstation cannot be adjusted, platforms to raise the shorter worker or pedestals on top of workstations for the tall worker should be considered. How can job design reduce the ill effects of working in a standing position? How can work practices reduce the ill effects of working in a standing position? A well-designed workplace combined with a well-designed job makes it possible to work in a balanced position without unnecessary strain on the body. Although the actual performance of the task depends on the worker (including how the worker stands, moves or lifts), work practices can make the job either safer or more hazardous. Proper training shapes individual work habits and should be provided by a supervisor who encourages the worker to use the skills they have learned. It is important that the worker be informed of health hazards in the workplace. In fact it is a legal requirement. The worker needs to understand which body movements and positions contribute to discomfort and that the conditions causing mild discomfort can lead to chronic injury in the long term. Worker training should also contain information on how to adjust specific workplace layouts to the individual’s advantage to reduce or eliminate health hazards. All these elements — training and supervision, coupled with active worker input — can result in sound work practices. It must be remembered that a well-designed job and workplace are essential to healthy and safe work. Without these, good work practices cannot be effective. Workplace design should fit the variety of workers’ shapes and sizes and provide support for the completion of different tasks. Precision work, such as writing or electronic assembly – 5 cm above elbow height; elbow support is needed. What are some do’s and don’ts regarding footwear? Your feet can only be as comfortable as the footwear permits. DO wear shoes that do not change the shape of your foot. enDO choose shoes that provide a firm grip for the heel. If the back of the shoe is too wide or too soft, the shoe will slip, causing instability and soreness. DO wear shoes that allow freedom to move your toes. Pain and fatigue result if shoes are too narrow or too shallow. DO ensure that shoes have arch supports. Lack of arch support causes flattening of the foot. DO wear shoes with lace-up fastenings. DO tighten the lace instep of your footwear firmly. The foot is prevented from slipping inside the footwear. DO select safety footwear, if required, that is CSA approved and carries the proper ratings for the hazard. The OSH Answers document Safety Footwearhas additional information. DO NOT wear flat shoes. DO NOT wear shoes with heels higher than 5 cm (2 inches). What do we recommend regarding floors in a workplace? the work process allows for rest. This entry was posted in Uncategorized on September 25, 2014 by administrator. CARMICHAEL, Calif., Sep 22, 2014 (BUSINESS WIRE) — The Foundation for Chiropractic Progress (F4CP), a not-for-profit organization dedicated to raising awareness about the value of chiropractic care, calls attention to a new report: “Impact of Chiropractic Services at an On-Site Health Center,”(Journal of Occupational and Environmental Medicine; September 2014) co-authored by Ross M. Miller, M.D., M.P.H., medical executive, Cerner Corporation; Sylvia L. Kindermann, M.P.H, senior research associate, Cerner LifeSciences; and Qingjiang Hou, M.S., scientist/biostatistician, Cerner LifeSciences. The studyconcludes that on-site chiropractic services are associated with lower overall healthcare utilization and lower subsequent costs when compared to off-site services, and follows an earlier study, “Value of Chiropractic Services at On-site Health Centers,” which found similar advancements, plus improved functional status of musculoskeletal conditions, linked with on-site chiropractic care. This entry was posted in Uncategorized on September 23, 2014 by administrator. Chiropractic adjustments have brought health to millions worldwide! 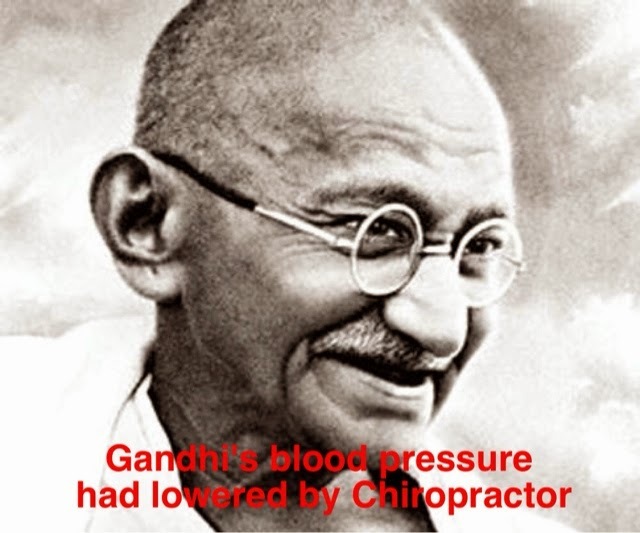 According to the National Chiropractic Journal in 1942, Gandhi benefited from Chiropractic when he was suffering from High blood pressure. After 3 months of regular treatments his blood pressure had lowered. This entry was posted in Uncategorized on September 19, 2014 by administrator. This entry was posted in Uncategorized on September 18, 2014 by administrator. Rubis L. Chiropractic management of Bell palsy with low level laser and manipulation: a case report. Journal of Chiropractic Medicine 2013. 12, 288-291. This entry was posted in Uncategorized and tagged 貝爾氏麻痺, 面癱 on September 17, 2014 by administrator.